This has long been believed to be Gracie in the roll of Miss. Marple. Sadly we now know it isn’t. 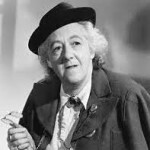 Following on from the success of her appearance in ‘The Old Lady Shows Her Medals,’ Gracie was chosen to play Miss Marple, the super-sleuth created by Agatha Christie. Gracie fields was the first actress ever to appear as Miss Marple in a filmed production of one of Christies novels (this one being written in 1950). 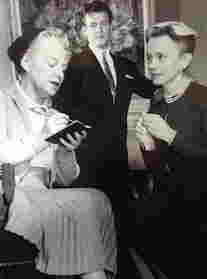 Gracie played Jane Marple of St Mary-Mead in the ‘Goodyear Television Playhouse’ production, aired on December 19th 1956 which was re-shown on December 30th. It recently came to light that a copy of this does still exist within a private film collector’s archive. As far as Gracie fans are aware, it is inaccessible. Until April 2015 that is !!! 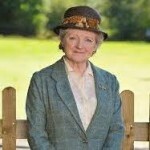 Her Miss Marple is finally found! 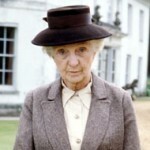 Books have been written about Agatha Christie Miss Marple adaptations which have made it very clear, that the very first televised adaptation of a Miss Marple novel (in which our very own Gracie plays the first Miss Marple ever, on any screen, even pre-dating Miss Marple films), was a ‘lost’ piece of television history. 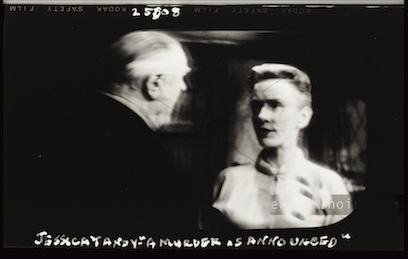 This was Goodyear Television Playhouse’s presentation of Christie’s 1950 novel “A Murder is Announced” which aired just the once, in America only, on December 30th 1956. It also starred Jessica Tandy and Roger Moore. However, it turned out that the books were wrong! 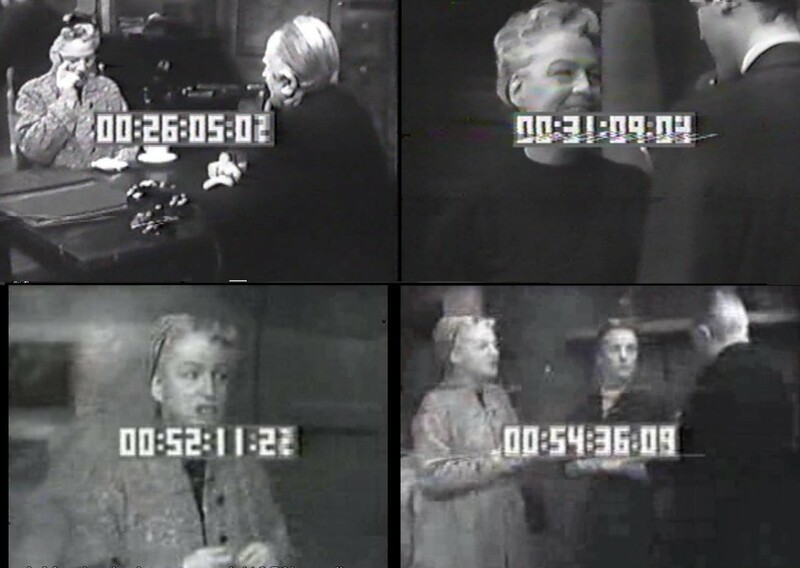 Following a now forgotten lead, ‘The Official Gracie Fields’ team member Chris Webster found the company that now owns the Goodyear archive, and learned that they DID indeed still own a master print, but they saw it only as a commercial property, which would only be made available by licence for silly money, in the sort of deal that would only be possible to a big DVD label or TV company. This seemed to be the end of the road. It DID exist, but was inaccessible. Earlier last year, Seb and Shaun each purchased a copy of different photographs from the production, which were the only known things still to exist aside from the locked away film print itself, but then more recently Chris discovered that it wasn’t quite as locked away as we’d thought, and some Christie collectors did have pirate copies of it. Unfortunately, they too were reluctant to be helpful, even for the research of a new Gracie biography (with one refusal actually coming from a published Christie biographer who’d used the print in his own research from the Christie angle! ), and kept their copies firmly to themselves, even when asked if a copy could be viewed privately ‘in situ’ with no possibility of a further copy being made to aid research. However, just this week Chris finally made contact with a Christie collector who confessed to having a copy (albeit Nth generation and time-coded) and who was happy to let us have a copy for research purposes, on condition that we do not let further copies out for the sake of his anonymity, which we of course agreed to respect, and our digital research viewing copy duly arrived recently. Screenshots have been deemed permissible though hence we are able to share these. Curiously, Gracie plays Marple as Scottish, which was an accent Gracie adopted several times, and must have been very comfortable with. 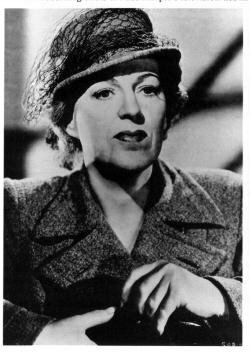 But whilst this does not fit in with Agatha’s English Miss Marple, Agatha did not give us a great deal to go on for Miss Marple’s character, and in fact Agatha herself changed her description over the years. Some of the possessive owners of private prints have only been vocal in as much as teasingly saying they did not like Gracie’s Miss Marple, but this is most likely largely based on her odd choice of Scottish accent, as well as the fact that film transferred to video runs at the wrong rate of frames per second, which speeds things up both visually and aurally, thus changing the pace and sound of the performance. 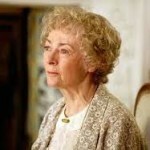 Allowing for these points, Gracie is as good and enjoyable as any other jobbing professional actress in the role, even if she doesn’t reach the perfection of Joan Hickson’s definitive Miss Marple. It has been a marvellous and special privilege to discover yet another string to Gracie’s bow.